Open and view two or more PDF files side by side, and convert PDF to TXT, BMP, JPG, GIF, PNG, WMF, EMF, EPS, and TIFF for free. Snip your desired text or graphics out of PDF document. Classic PDF Reader lets you feel home with everything classic. Windows 10 is great, but if you want to run two instances of a modern PDF Reader app at the same time or read two PDFs side by side, but it\'s only possible to view one at a time using the Reader apps. You can switch between two PDFs open in the PDF Reader app, but not in the same way as switching between open documents in other apps. Rather than being able to Alt-Tab or Windows-Tab through things, you have to use a menu. Inconsistency once again.The solution is to install a Classic PDF Reader that allows for multiple documents to be displayed side by side, but why should you? Sod it, you might as well install Classic PDF Reader and use it alongside Windows\' own Reader – at least then you can be consistent with your use of inconsistent interfaces. It takes you back to your previous complaint of Windows 10 being like a rollercoaster ride. More advanced features include the conversion of PDF to TXT, BMP, JPG, GIF, PNG, WMF, EMF, EPS, and TIFF, snipping your desired text or graphics out of PDF file. As an alternative to Microsoft PDF Reader or Adobe Reader, Classic PDF Reader is extremely fast and responsive when you scroll your mouse between PDF pages on Windows 10. 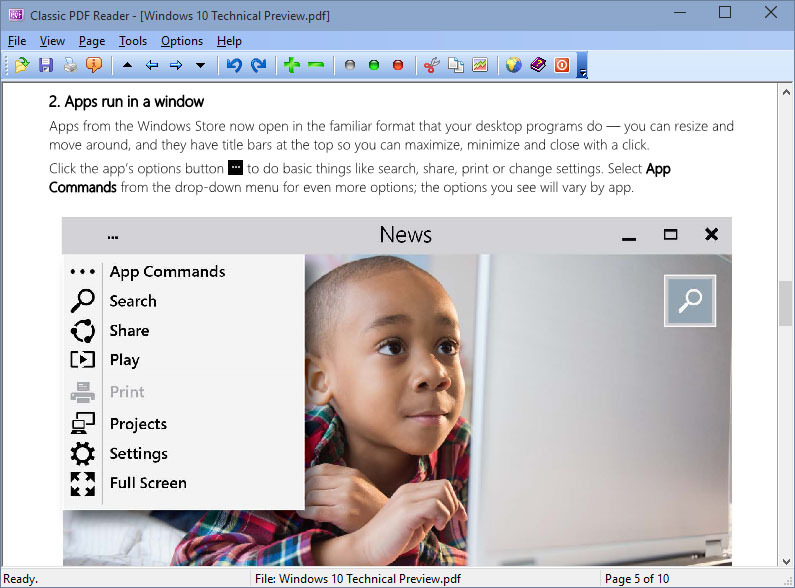 Open and view PDF files in multiple windows, and read them side by side in Microsoft Windows 10. Cut and paste your desired text and graphics out of PDF document. Convert PDF to text and graphics in BMP, JPG, GIF, PNG, WMF, EMF, EPS, and TIFF format. Present your PDF file as a PowerPoint slides in a full-screen show.. Drag the view area by scrolling your mouse wheel. View graphics and text in high resolution. PDF files with Asian, Hebrew, Arabic and other language fonts can be opened and viewed without difficulty. CompuPic 6.0 is the fastest, easiest to use digital content manger. Browse, view, edit, share and use over 70 file formats. CompuPic is unmatched in speed...3x faster than ACDSee and 9x faster than Thumbs Plus. Full of powerful features. Fisheye Player creates 360 degree Virtual Reality. By using single shot of Panoramic(Fisheye Lens and other) image, No stitching needed. Also Generates Windows application and Web Page.